I am pretty certain that we will have a photo booth at our wedding, I love photos and want to get as many as humanly possible of all our friends and family on our big day. But there are so many different ways to do it! Where on earth do I start!? Here are some ideas I found on Pinterest to get the creative juices flowing. 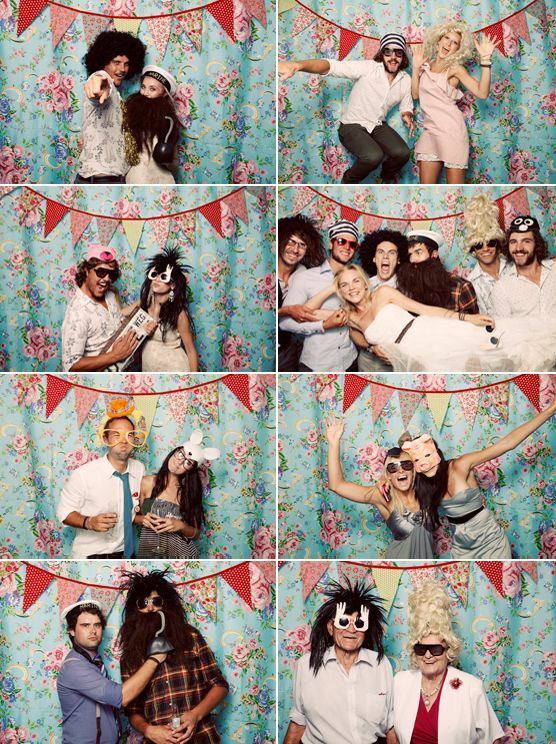 I must admit, I do like the idea of hiring a photobooth like the one above. You can get some that will print out 2 copies of the photos (1 for us to keep and the other for the guests to take home) and it also saves them as digital photos which you get at the end too. Unfortunately I don’t think this will be an option considering our budget, but this also gives us a chance to create something really unique and wonderful ourselves! When you look at what fantastic boothes other people have made it seems silly to spend so much on a normal one! Props will be super important, and I expect we will be making them all ourselves so I’d better get my thinking cap on. The ones above are all lovely and would be easy to re-create ourselves. I love this idea so much! A chalkboard as a backdrop! The guests could draw whatever they wanted and make it really silly! I think it is a big priority for me that everyone has as silly a time as possible! Also that all of the guests personalities come across in the photos, which I think this would be perfect for! Also, I like that your guests could write you cute messages. Although knowing some of our friends I suspect a lot of the messages will be rude rather than cute! I just love the picture below of Elsie from A Beautiful Mess with her hubby, so simple but lovely. The more I think about this the more excited I get! Chris bought me a polaroid camera for my birthday, so we shouldn’t have any trouble DIYing this one, however we decide to do it.